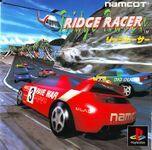 Namco's hit 3D racing arcade classic; Ridge races was one of the first arcades that used vector bitmaps. It allowed for high speed drifting and bumps in the road where the car jumped, something very revolutionary at the time. It was released the same day Sony's Playstation was released, becoming a smash hit for that platform. The drifting mechanism in the PS edition later became known as the "magnetic rail drift", as the car, once it had lost grip to the ground, merely followed the road as if running on a magnetic rail.